Mumbai: The chemicals and plastics sector exports registered 22% growth on a year-to-date basis, announced Shri Suresh Prabhu, Hon. Union Minister for Commerce & Industry, Government of India. Hon. Union Minister inaugurated the 3rd Edition of CAPINDIA 2018, under the aegis of the Department of Commerce, Government of India (GOI), supported by Department of Chemicals and Petrochemicals, GOI and organised jointly by PLEXCONCIL, CHEMEXCIL, CAPEXIL & SHEFEXIL, is one of the largest sourcing and networking events for the Chemicals, Plastics, Construction & Mining Industries and Allied Products. The State of Gujarat is the State Partner for CAPINDIA 2018. This expansive ‘Make in India’ showcase of India’s manufacturing capacities and capabilities (including its abilities to service overseas markets) is being held from 22nd to 24th March 2018 at the Bombay Exhibition Centre, Goregaon, Mumbai. The initiative is a showcase of the country’s world-class manufacturing capabilities and capacities and aims to enhance exports of Indian manufactured products. The 3-day exhibition is spread over 18,000 sq. mt and hosts 700+ manufacturers/exporters, who are showcasing hundreds of products, including a range of Industrial & Agricultural Raw Materials, Consumer Items, Packaging Items, Plastics Processing Machinery and Construction Materials, Mining Products amongst others. 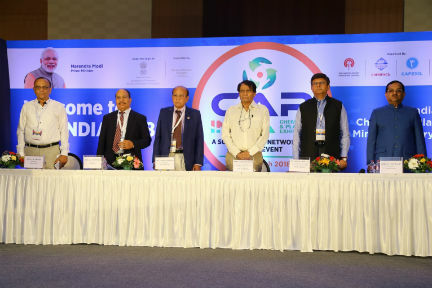 CAPINDIA hosts 400 International buyers from across the globe who are being invited to attend the Buyer Seller Meets being organized as part of the Government’s MAI Scheme to promote key export segments through platforms that foster closer trade collaboration between Indian manufacturers-exporters and target countries. The show is expected to receive over 10,000 visitors comprising Domestic & Overseas buyers, International Agents and Distributors seeking market representation from Indian exporters, End Users seeking raw materials for captive consumption, Private Label Buyers, Merchant Exporters, Industrial and Marketing Consultants, Central and State Government Departments & Agencies and many more. Mr. R. Veeramani, President, CAPEXIL, said, “CAPINDIA 2018 Exhibition is slated to be one of India’s largest global sourcing shows for products in our business. CAPINDIA 2018 will be significant as it is the first mega industry event following Union Budget FY2019 and the implementation of GST, which will have a significant bearing on targeted exports in sync with the Government’s vision for Year 2022. The export target fixed for CAPEXIL products is US$ 16.45 billion for the year 2017-18 which marks a 9.6% growth in exports compared to US$ 15.01 bn in 2016-17. The construction and mining sectors are responsible for propelling India’s overall development. Panel-wise exports for CAPEXIL touched US$ 16.12 billion during the period from April 2017 to February 2018 showing a growth of over 19% compared to corresponding period last year’s corresponding figures of US$ 13.52 billion. Exports of Construction & Mining products is significant and shows potential for growth. CAPINDIA 2018 event will also have participation from all major industries and sectors including Granite, Natural Stone, Marble, Minerals and Ores, Paints, Coating, Glassware, Furniture, Ceramic, Sanitary ware, Cement, Clinkers, Asbestos, Paper, Paper board, Stationary products, book Publishers and Printers.